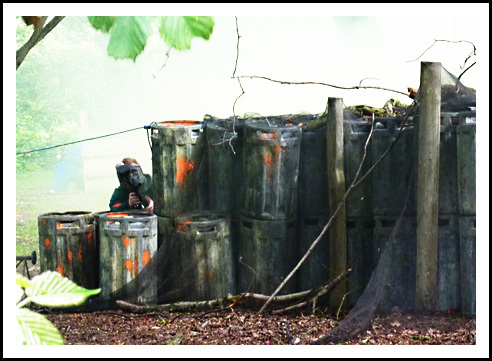 At SAS Paintball UK, we have developed the ultimate UK Paintball site. We are the only Paintball site in the UK to provide varied indoor Paintball, outdoor Paintball, and woodland Paintball fields - from one convenient West Midlands site. 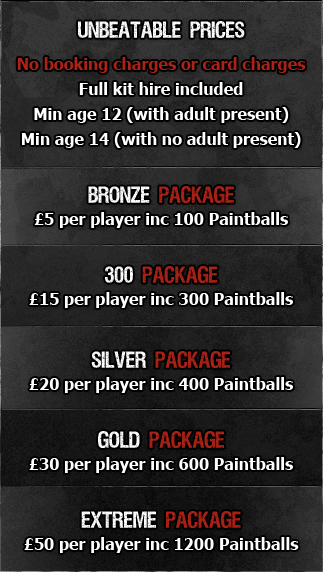 For the first time, you can play the 3 types of Paintball games from our Paintball site in Wolverhampton - now for just £5 per player! Got your own Paintball equipment and want to use it? No problem - just bring it along. More info on our walk on days. 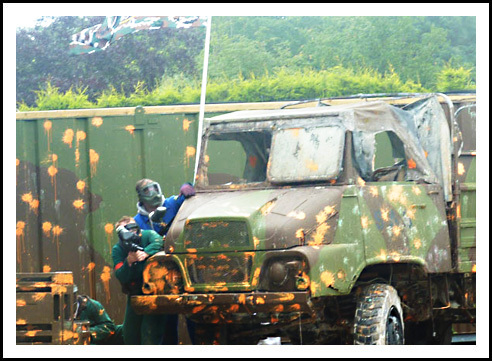 SAS Paintball UK's Paintball fields include 2 x indoor Paintballing games, covering over 33.000 sq ft. Indoor Paintball is enhanced by special effects such as smoke machines, strobe and UV lighting, vehicles, and many different kinds of cover. Take part in the ultimate indoor Paintball experience at SAS Paintball UK. 4 x urban and outdoor Paintball games include trenches, fuel dumps, a military vehicle compound, bases, The Bunker, and firing range. 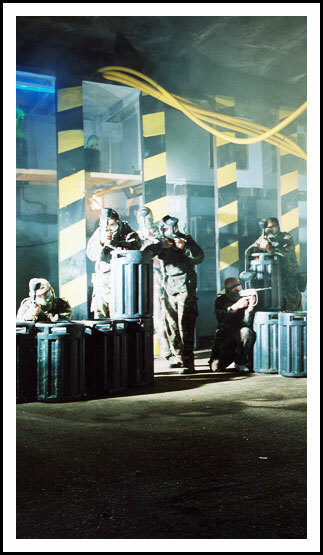 We have a Speedball Paintball arena, the ultimate fast paced Paintball field. 5 x woodland Paintball games - Tunnel Hell, POW camp, Trenches, Bridges, Gold Run. The Paintball site is floodlit, so night Paintball games can be played. As well as Paintball, we now offer Laser combat games. Laser games are a great alternative to Paintball, and are suitable for players aged 8 and over. If you have young players (aged 12 or over), we can also provide junior paintball sessions, where they play amongst players of their own age. the best prices in the uk? All our games are scenario Paintball games. Scenario Paintball means that our Paintball games includes a range of mission objectives, designed to allow players to experience all aspects of Paint ball - and develop winning tactics. At SAS Paint ball UK, you can develop your own playing styles - as a lone wolf, team player or sniper, there are Paintball scenarios to suit your style of play. From fast and frantic indoor Paintball, to long range sniping in dense wood cover, each Paintball scenario is designed to provide the maximum adrenaline rush. 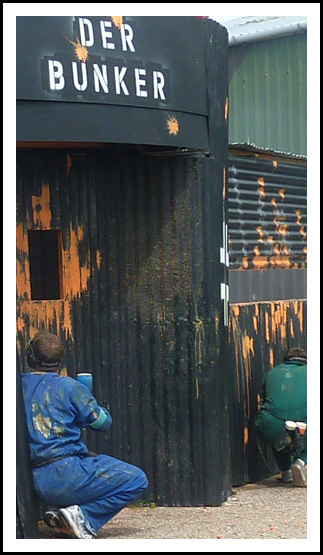 Our varied Paintball fields are ideal for any group including Stag parties and junior Paintball groups. Paint ball at our site is varied, challenging, and the ideal activity for your corporate event. Let SAS Paint ball UK make your team building event an exciting and memorable day. Our Paintball site has full male and female changing facilities, indoor loos, seating areas, lockers, a burger bar and on site parking. This website is not active anymore. No bookings can be made. SAS Paintball UK was voted 10 out of 10 in 24 votes by players! Are your legs screaming for a rest? Relax after a game of paintball by playing some fun online games at the best uk casinos! Thankyou SAS Paintball wish I could work there full time!